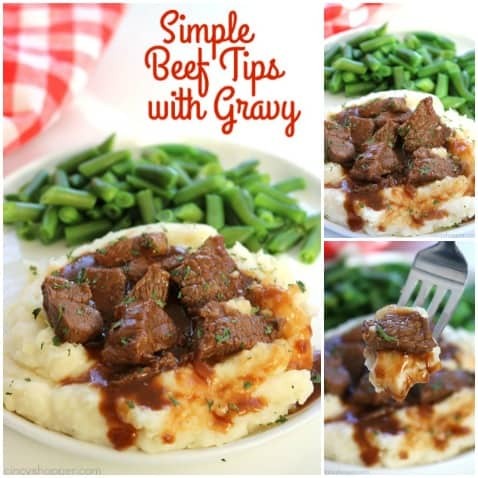 If you are needing a quick and easy meal, these Simple Beef Tips with Gravy will be perfect. Small cuts of beef lathered in gravy. Perfect with or without mushrooms, serve them over mashed potatoes or egg noodles… you choose. Ready in about 30 minutes! My family loves comfort food all year long. When the winter months hit here in Cincinnati, we eat comfort foods almost every night. 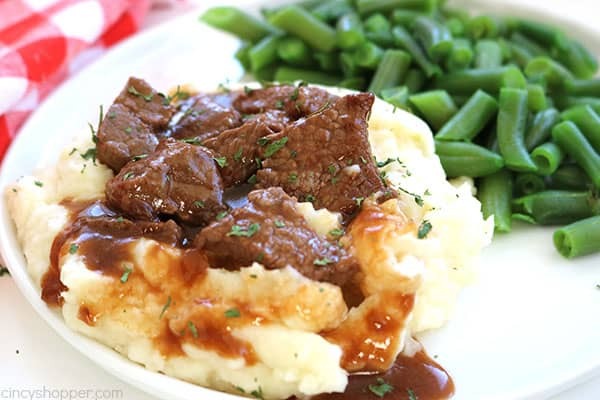 We make our Simple Salisbury Steaks and Slow Cooker Meatloaf the most. I guess you could say we like our meat and taters, lol. I like quick and easy meals. If I do not have the ingredients on hand for meals that are simple, we end up eating take-out. So, these Simple Beef Tips and Gravy are one of my go to meals especially during the winter months when everyone is craving comfort food. The flavor is awesome and every family member devours it. This dish is so super quick. I can have everything made and on the table in just a little over a half hour. Some of my kids like onions, some do not. I make this recipe with French Onion Soup… it hides the onions from those picky eaters. None of my kiddos like mushrooms so I usually make two pots and add mushrooms for the hubby. 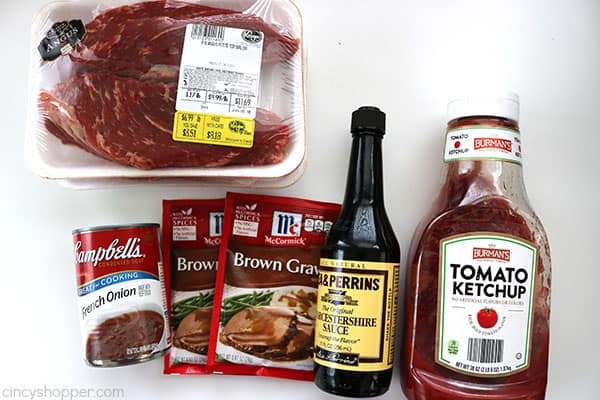 For this recipe, I use a better cut of beef like sirloin. It can cook quickly and not be too tough. 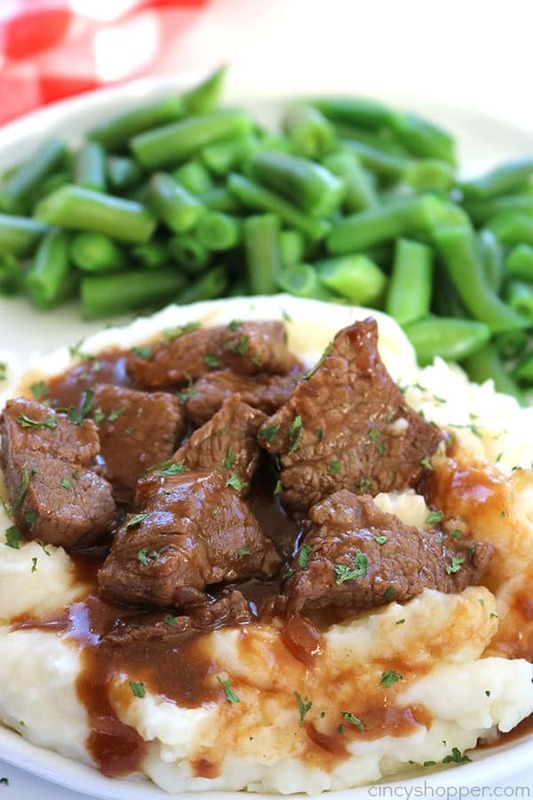 If you plan to use a cheaper cut of beef for your beef tips, you will need to let your dish cook longer. I would say around 2 hours to get your meat tender. 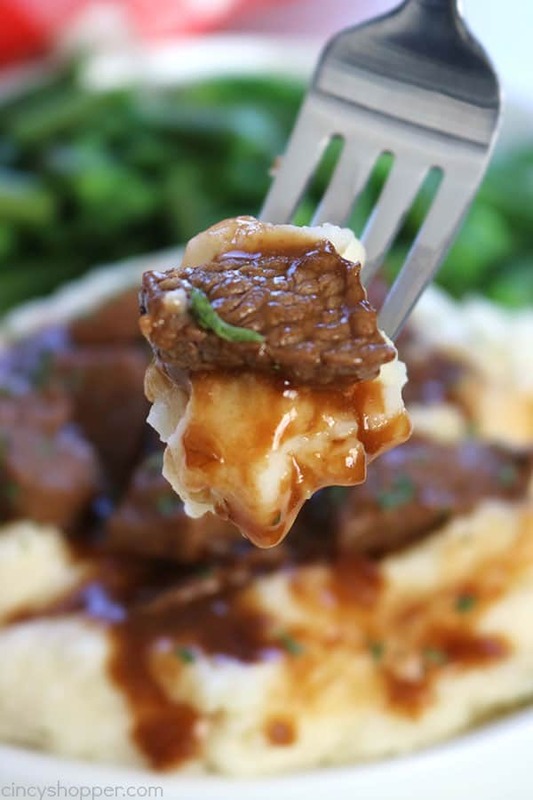 I have served our Beef Tips with Gravy on top of mashed potatoes and also on egg noodles. Both ways are always so delish. Cut sirloin into bite sized pieces (about 3/4 inch). Heat a little olive oil in a skillet over medium high heat. In a bowl, conbine remaining ingredients and whisk until blended. Add liquid to skillet and bring to a boil. Reduce heat to medium low and allow to simmer until sauce is thickened and meat is tender. Do you have a favorite comfort food dish? 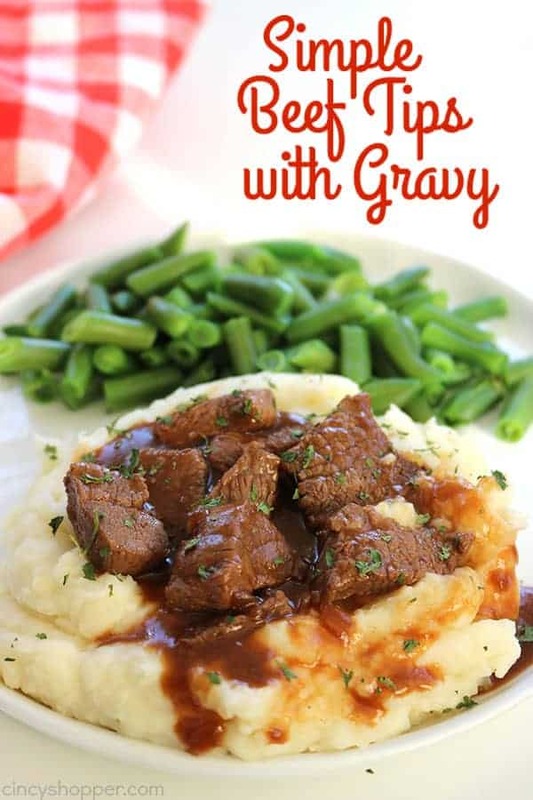 If you are needing a quick and easy meal, these Simple Beef Tips with Gravy will be perfect. 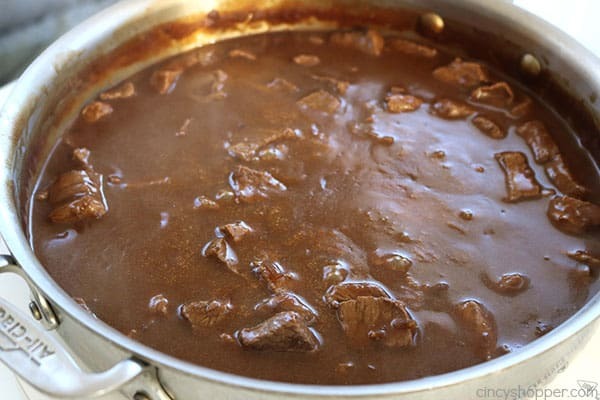 Small cuts of beef lathered in gravy. Perfect with or without mushrooms, serve them over mashed potatoes or egg noodles... you choose. Ready in about 30 minutes! Is there another type of soup i could use? I don’t use anything onion. This really looks easy and yummy too.Even i don’t like mushrooms, so i will skip that.Beef is my all time favorite food. I use to try different varieties of dish using beef.And this is really simple.Will try soon and will give you the review of recipe.I can use onions as it is also right? About how long until meat is tender? This looks like a great hearty meal for the family.It’s quick and easy yet looks so put together. The gravy looks very rich, can’t wait to make this on my own!